Derived from the comprehensive two-volume set, Genomic and Personalized Medicine also edited by Drs. Willard and Ginsburg, this work serves the needs of the evolving population of scientists, researchers, practitioners and students that are embracing one of the most promising avenues for advances in diagnosis, prevention and treatment of human disease. 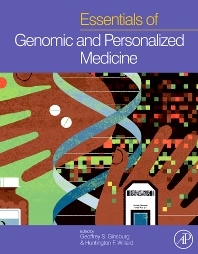 From principles, methodology and translational approaches to genome discoveries and clinical applications, Essentials of Genomic and Personalized Medicine will be a valuable resource for various professionals and students across medical disciplines, including human genetics and genomics, oncology, neuroscience, gene therapy, molecular medicine, pharmacology, and biomedical sciences. Updates with regard to diagnostic testing, pharmacogenetics, predicting disease susceptibility, and other important research components as well as chapters dedicated to cardiovascular disease, oncology, inflammatory disease, metabolic disease, neuropsychiatric disease, and infectious disease, present this book as an essential tool for a variety of professionals and students who are endeavouring into the developing the diverse and practical field of genomic and personalized medicine. the Host Response to Pathogens"